The type 191400 is the prime choice for nearly all applications in the food and beverage industry. Because of its optimized body design the valve is pocket free so that bacteria or any other kinds of contamination are avoided. The seat is an integral part of the body to avoid additional gaps. The O-Ring packing and general bonnet design ensure a very com-pact overall height. The stem is guided by a PTFE bushing for precise control, reduced friction and minimal wear. A wiper ring is provided to protect against contamination from the outside. Repair, maintenance or the replacement if individual parts is easy to perform because the body and the bonnet are connected together by a clamp. 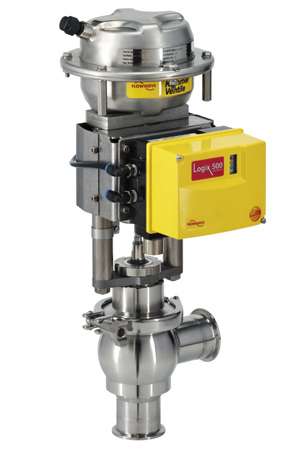 Both valve types 191700 and 191800 were developed for aseptic applications in the pharmaceutical industry as well as bio-technology and ultra clean applications. An aseptic diaphragm made from EPDM with a TFM coating is used to seal the media from the environment. To extend the lifetime of the diaphragm a support ring is installed on the reverse side of the diaphragm. For different applications there are two options available. Type 191700 with aseptic diaphragm without a stem O-Ring seal but with leakage detection hole in case of diaphragm damage. Type 191800 with an additional O-Ring seal and 1/4 inch NPT test port for leak detection. Both versions use the same body, aseptic diaphragm and plug heads but have different bonnets and stems.